Oracle Application Express is the great tool for developing Web Application with SQL and PL/SQL. Users can develop and deploy Web based applications for desktops and mobile devices. If We will be talking about books about APEX. 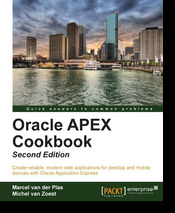 I mention a book title Oracle APAC Cookbook - Second Edition by Michel Van Zoest and Marcel Van Der Plas. I had a chance as technical viewer on this book. So, I found it is interesting book about Oracle APEX. It was written to cover Oracle APEX 4.0 - 4.2 with 14 Chapters. Examples in a book are very useful. Readers can follow each topic (example) and practice it. A book is for some people who are new with Oracle APEX and want to start it. For some people who know and work with Oracle APEX, they can use this book like reference and learn something new in APEX. So, I think it's a good idea to keep this book in your APEX shelf. I still believe a book is easy for reading... and learning in APEX.